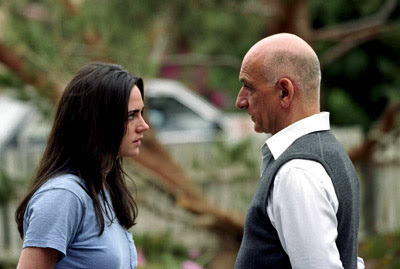 House of Sand and Fog (2003), the much-praised feature film debut of Vadim Perelman, was based on the acclaimed 1999 novel of the same name by Andre Dubus III that was nominated for the US National Book Award. The story concerns an irreconcilable struggle over the ownership of a California beach house. Although highly melodramatic, the film actually does encompass a rather nuanced and sympathetic view of the two competing groups and avoids obvious bias in the conflict: throughout the film the focalization and sympathetic perspective is almost equally divided between the two competing sides. Since the two sides comprise an upper-class Iranian family and a lower-class American, such narrative balance, along with exceptionally good acting, builds up an expectation as the plot develops of interesting and dramatic social interactions. Unfortunately this promised profundity is never realized. Nevertheless, what is interesting about the film is that it raises issues concerning our sense of justice, which go beyond the traditional simplistic Hollywood moral tale. At the outset of the film, Kathy Nicolo, the protagonist of one of the “lower-class American” narrative thread, is awakened with the news that the house in which she is living (and in which she grew up) has just been repossessed by the county for nonpayment of a $500 property tax. She is being immediately evicted. Kathy, we gradually learn, works as a cleaner and has been living a disorganized life since her husband left her eight months earlier. The sympathetic deputy sheriff present during the repossession, Lester Burdon, advises Kathy to consult a public defender and offers his support. The other narrative thread concerns a once-wealthy Iranian family of high standing that has fled the oppressive circumstances in their home country and is struggling to make do in California. The father of the family, Massoud Behrani, was a colonel in the Shah’s army, but now in California he works in two menial jobs – at convenience store and as a civil ditch digger. When he learns that a beach house (Kathy’s) is about to go on public auction, he sees his chance to make a real-estate profit and improve his family’s fortunes. Kathy is disorganized and disheveled. She neglects opening her mail, and there are suggestions that she may have had alcoholic or drug dependencies (this is apparently more explicit in the novel). What happened with her? Why did her husband abandon her? Lester, a married man, becomes Kathy’s friend and eventually her lover. We understand that his marriage has gone cold, but we don’t really know much about his character. What drives him? It would be particularly useful to shed light on Massoud’s psychological background. His wife at one point accuses him of having made decisions back in Iran that necessitated their flight from the country and the ruination of their life. Is there something in his history that haunts him? I would like to know more. What we do know is that Kathy is essentially a weak personality who cannot get her life together. She doesn’t understand the basic rules of the game of life, and she apparently frequently goes off the rails and falls into a funk. She is the type of person who needs protection in this cruel world: a truly just society should not take advantage of characters like Kathy. Massoud, on the other hand is the opposite type of personality. He is a strong, vigorous individual who is used to the rule-driven society of the military culture. He is rigorously honest and plays exactly by the rules, taking his lumps when he’s down, but cashing in when he’s ahead. At the public auction he acquires Kathy’s house for a song at approximately a quarter of its market worth, and he anticipates that he can resell the house and thereby lift his family out of poverty and fund his teenage son’s college education. So relatively early on in the story an interesting conflict has been established between two basically implacable foes. Kathy has lost possession of her house due to a minor oversight, and anyone can see that a clear injustice has been perpetrated against her. We’re on her side: she should have her house restored to her. Even Massoud with his own financial concerns can see the inherent injustice that has happened to Kathy. On the other hand, Massoud has been playing carefully by the rules – the same even-handed rules that supposedly govern everybody in the universally admired “rule of law” society that operates in America. So we are on Massoud’s side, too. Anyway, Massoud is evidently not going to forego his chance to save his family in this dog-eat-dog competitive society in order to “reward” someone like Kathy whose lack of diligence and sloth is directly responsible for her misfortune. All of these ruminations would probably be even more interesting if we could be privy to some of the thinking, perhaps via internal monologues, on the part of Massoud and get inside his character. But this we cannot do, as the film presents him as an opaque and stubbornly closed personality. Massoud rules his family like a military platoon and provides no explanations for his decisions (it seems that his wife doesn’t even know that he is employed at menial jobs: he leaves for work each day in a business suit and makes himself out to be an executive for Boeing). This is the interesting narrative road, the two competing forms of justice, that was not taken by Perelman and his team. What we could have had in the film was the struggle in Massoud’s mind between his intuitive sense of justice (according to which Kathy’s case would be viewed sympathetically) and his rule-driven sense of justice that would weigh more favorably on his own side. It would have been interesting to see this social and judicial evaluation undertaken by a newcomer to the United States who might be expected, at least on reflection, to see the American system with the external eye of a more detach and objective observer. At the same time there is another interesting angle here: the sense of justice that might be considered from the perspective of Kathy’s lover, Lester. He is, after all, a man who works within the law-enforcement system, and yet, as an insider, he knows that t he rules sometimes need to be bent in order to achieve “true” justice (i.e. following our intuitive sense of what is right) in certain circumstances, such as Kathy’s, where the rules were improperly applied or twisted against her in the first place. In addition there is the conflict in Lester’s own personal life between the conventional rules of marital fidelity and his personal realization that Kathy is his true soul-mate and the person with whom he has more natural affinities. Again it is a conflict between one’s intuitive and subjective sense of justice (which, of course, can sometimes be clouded by emotion) and the rigid application of externally defined rules that cannot work out perfectly in all contexts. Still another interesting perspective to highlight might have been the position of Massoud’s wife, Nadi. Not knowing anything about the financial circumstances or conflict, Nadi treats Kathy (when she suffers an injury at the beach house), who is a stranger to her, with characteristic Persian graciousness and compassion, a culturally ingrained behaviour characteristic of Iranian society. Her role, as another and contrasting outside of observer of American society, might have been given more examination. So there were four significant characters to follow: Massoud, Lester, Nadi, and Kathy – with Kathy being perhaps the least interesting one to “get inside of”, because the injustice done to her is so obvious. We don’t have to wonder much about her mental state, because we readily understand it. But of the four, the film spends a great amount of screen time, maybe too much, on Kathy and not enough on the other three. This was probably due to the presence of the very beautiful and talented actress Jennifer Connelly, as Kathy. Connelly does well, but it might conceivably have been better for the film narrative to have someone less attractive in the role. The performances of all four of these characters, by the way, are excellent. 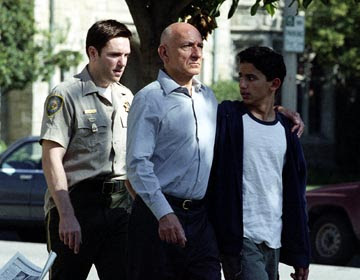 Besides Connelly, Ben Kingsley gave an energetic rendering of Massoud’s character, and Ron Eldard, for the most part, was effective as a measured and reflective Lester. The role of Nadi, which I feel would have liked to see given more weight in the plot, was sensitively played by Shohreh Aghdashloo, a distinguished Iranian actress who, like the character she played, was forced to flee the Iranian social violence in 1979 and start a new life overseas. But even without our full immersion into Massoud’s, and Lester’‘s moral struggles, we still have a potentially interesting plot situation. The viewer is made to feel some sympathy for all sides, and yet all sides are uncompromising and inexorably headed for a conflict that will be disastrous to at least one of them. How will this all be resolved? Unfortunately, with the viewer’s sense of suspense built up by this relentless buildup of tension, the narrative quixotically heads south and loses its way. Instead of moving towards some kind of resolution to the conflict, it seems that utter hopelessness takes over as a superficial plot remedy and defeats them all. Without warning, Kathy attempts suicide, twice. And at the end of the film, after Lester’s mysteriously belligerent intervention leads to the accidental death of Massoud’s son, Massoud poisons his wife and then commits suicide, himself. Thus everything turns out to be a manufactured tragedy of monumental proportions, without anything even close to proper motivations or seeding. Why? There is no real resolution -- just submission, defeat, and death. It is enormously sad, but the issues have been abandoned. House of Sand and Fog is an interesting film, but it could have been better.